Has your son ever seen a rhino? Does your daughter know everything about elephants? Can you ride a crocodile? 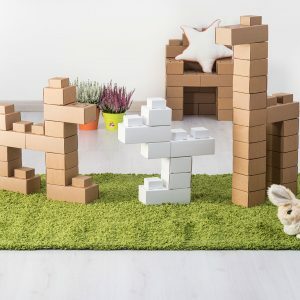 Find all this out with this safari kit that includes everything you need to create your kids’ favourite beasts: 50 giant blocks, cardboard tails, horns, tusks and ears, stickers with eyes, paws and teeth. The Giant Safari is ready to start. The Rhino - 50 Blocks + Safari Kit Free! The Crocodile - 50 Blocks + Safari Kit Free! The Elephant - 50 Blocks + Safari Kit Free!